1. FIRST IMPRESSIONS: You know what they say – first impressions are lasting. Well, based upon the first weekend of games between the 16 playoff teams, the Warriors, Bucks and Rockets jumped off the page to me as three teams that have their act together and are ready to roll at the right time. Obviously you can say the Clippers, Bucks and Jazz don’t pose the challenge of what’s to come, but it’s more than that. It’s about how a team carries itself on the floor and how they click together while putting their opponents on their heels. If you’re a fan of these three teams, you’ve got to be pleased. 2. BLAKE GRIFFIN (Pistons): The Pistons were clearly leaking oil down the stretch with Griffin in a diminished state or unable to play. Now, with him missing Game 1 versus the Bucks and rumoured to possibly be out for the series, his team is up against it. He’s had a terrific season for them and he’s the one that makes them go. If he’s unavailable, I see them having no chance to win a game versus the powerful Bucks unless Milwaukee goes on cruise control. Basketball is a sport where that one guy can make such a huge difference and that is clearly the case here. 3. 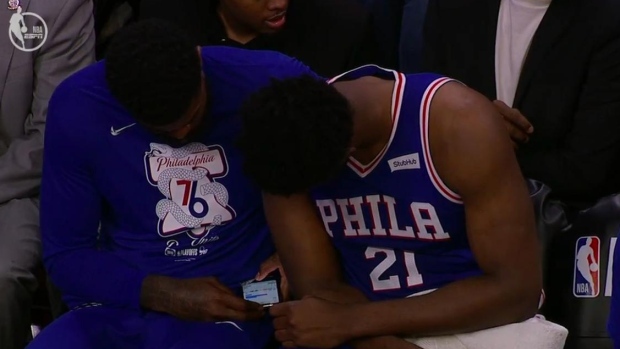 AMIR JOHNSON (Sixers): I’m not sure what he’d ever be doing with a phone on the bench, but that’s probably a reflection of folks’ obsession with their cell phones. He’s catching a lot of flak and understandably so. He deserves to be fined. I’ll say this though, beyond the fine, let’s move on. I can say this first hand: He’s a class guy, great teammate and good pro. Let’s not have this moment define who he is or what he’s been as a pro. Overwhelmingly, he’s had a good run. 4. GREGG POPOVICH (Spurs): Congrats on setting the record for the most combined regular season and postseason wins, surpassing Lenny Wilkins with 1,413 after their terrific road win at Denver on Saturday night. He’s done a phenomenal job with his team this year and it shows once again his adaptability and creativeness as a leader. Certain guys stand out far beyond the pack and once again he’s shown it this season. Job well done, Pop. 5. COACHING OPENINGS: Now that Luke Walton has already made the jump from L.A. to Sacramento in the blink of an eye, we await decisions on the direction of the Lakers, Cavs and Grizzlies with regard to their openings. I can look at each situation and think that the greater emphasis has to be on the front offices of each franchise figuring out the proper personnel direction for their respective clubs. You can change coaches all you want, but ultimately the defining decisions are based upon the talent and types of people you bring in. The coach complements and then reacts and leads based upon what he has in front of him. It’s a partnership that has to mesh cohesively.